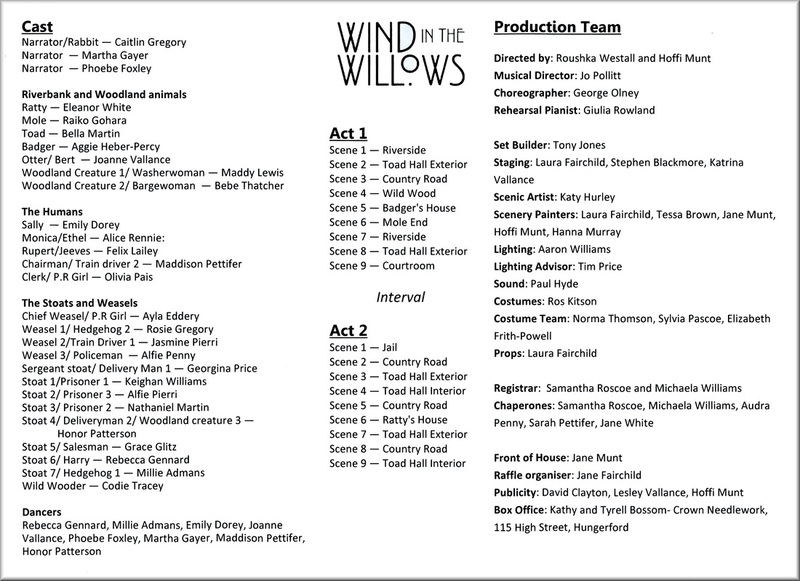 The 2014 CHILDREN'S THEATRE success was Wind In The Willowsc™- a new musical with music by Mark and Helen Johnson and script by Sue Langwade. Follow the adventures and escapades of Ratty, Mole, Badger and the infamous Mr Toad in this delightful adaptation. The lively and absorbing script allows for the inclusion of many minor characters as well as the traditional key players. 12 great new songs, with a Twenties flavour, bring this wonderful story to life. Wind In The Willows™ is perfectly suited to the upper Primary age-range, lasting approximately 80 minutes with a single interval. There is plenty of scope for solos, part-singing, choreography and audience participation, the whole production being massive fun to learn and perform. "Once again I became extremely proud to be a member and vice-president of this company as I joined the audience at the Children's Theatre performance of Wind in the Willows. A fabulous evening of entertainment enhanced by excellent acting and singing from a very talented cast which brought a standing ovation at the end. Their infectious enthusiasm was a joy to behold." "The production deserved to have been performed in a proper theatre and it is sad that Hungerford does not have one. This fact however does not diminish my praise for a superb performance and I thank you all for giving me much enjoyment. Well done to all, cast, crew and the producers. May you continue to enjoy being involved in such productions."